Put on your thinking caps, my friends, ’cause it’s time to get philosophical. Ponder me this: What constitutes an “Android device”? It’s something I’ve been mulling ever since word broke that the entire Google Play Store of Android apps would be coming to Chrome OS — and it’s a question I’ll ask you to keep in mind as we take the time to think through that move and what it could mean for us as consumers. In case you were hiding out in a bunker last few months and didn’t hear, Google officially announced that it’ll be possible for you to download Android apps on Chromebooks and use them as if they were native programs on the platform. Infact, several chromebooks are already running android apps now. It’s a pivotal step in the long-rumored “merger” of Android and Chrome OS — one that further solidifies the notion that this isn’t the kind of “merger” most folks were expecting. It’s easy to hear the news of Android apps coming to Chrome OS and respond with an understated nod — “Hm! You don’t say, my dear fellow! How very interesting!” — but mark my words: This seemingly simple shift could have a monumental impact. We’re talking the type of rippling change that could affect not only Chromebooks but potentially the entire mobile market. Yes, oh yes: There is much more to this move than meets the eye. 1. The addition of Android apps redefines a Chromebook’s possibilities — and limitations. Regardless of what the ignorati may tell you, Chrome OS has actually been useful for quite a while now. It’s just been useful for a very specific type of computer user — someone who spends most of his time using the Web and Web-centric services. And you know what? These days, an awful lot of people fall into that category. I use a Chromebook for travel and away-from-my-desk computing, and I very much appreciate all the traditional PC hassles it takes out of my life — but situations like those keep Chrome OS from being practical as a primary computing environment for me. The addition of Android apps will fill those sorts of gaps and make the platform far more versatile — and thus far more viable for people in my almost-there sort of situation. Think about it: With Android apps in the equation, Chromebooks will gain the ability to offer things like Microsoft’s full suite of Office utilities. They’ll have a variety of powerful image editors along with a fully functioning Skype client and a wealth of other tools that’ll eliminate many of the holes in a Web-centric environment. If it’s available on Android, it’ll be available on a Chromebook as well. That certainly isn’t going to make Chrome OS right for everyone — nor will it provide any sense of instant magic– but it’ll absolutely broaden the platform’s appeal and give it a whole new kind of life. 2. With this shift, Google is essentially creating a new category of device. Everyone and their mother has been scrambling to build a device that combines the productivity-friendly environment of a desktop computer with the familiarity and fun of a popular mobile app store. 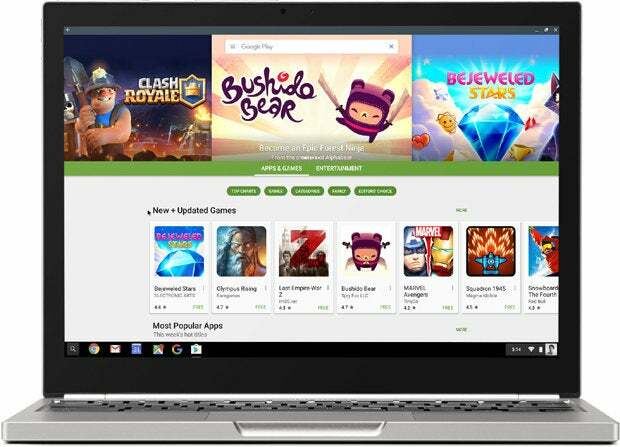 By bringing the full Play Store onto Chrome OS, Google has effectively turned the Chromebook into a crazy kind of hybrid computer — one that represents the best of both worlds. While tech-watchers were obsessing over the idea of Android and Chrome OS being combined into a single platform, Google was working to align the two platforms in a far more interesting way. Rather than being part of a one-or-the-other proposition, Android and Chrome will actually work together to achieve a whole new kind of harmony. Soon, a Chromebook will give you the fast-booting, auto-updating, virus-worry-free environment of Chrome OS — which is perfectly suited to desktop-caliber multitasking and productivity — along with the versatility of the entire Android app market. You’ll have a great laptop keyboard and capable trackpad. You can snap between windows with ease and do whatever work you need in the full Chrome browser. And then, when you want a mobile-like experience or access to a function Chrome can’t provide, you can open up any Android app you want. What’s particularly fascinating about this environment is that it’ll blend Android apps and Web apps together in an almost indistinguishable way. Google has come up with a system that’ll allow Android apps to run in one of three window sizes, all movable and ready for multitasking. The apps will automatically support keyboard, mouse, or touch input and will feature seamless integration with Chrome’s own file and notification system. All signs and early demos suggest they really will feel like a native part of the platform. That means you could have the Google Docs Web app open alongside the Skype Android app and a handful of Chrome browser tabs, and you wouldn’t even think about the difference between any of those elements. They’re all just programs on your categorization-defying computer. Don’t forget, too, about Android Instant Apps — a separate initiative just introduced by Google that’ll allow you to use apps instantly, on demand, without ever even installing them. Google has indicated that this system should work on Chromebooks as well. So eventually, opening and using an Android app on a Chromebook could be absolutely no different than opening a Web page; it’ll just be another link you click and another window that pops up on your desktop. Especially with options for touch-enabled, swiveling, and screen-detaching forms — and make no mistake about it, we’ll be seeing many more such Chrome OS devices in the months to come — Chromebooks truly are about to become the new Android convertibles. Or Android-plus convertibles. Or whatever you want to call them. After all, the regular Android environment makes a lot of sense for standalone screens, where portability is important (e.g. phones) and/or input-centric productivity is limited (e.g. tablets). Those are the sorts of uses the operating system was designed to serve. But if you’re looking for something that doubles as a slate and a keyboard-equipped laptop, why use a traditional Android tablet when you can use a system that runs all the same apps in a more versatile and productivity-friendly environment? 3. By expanding the reach of the Play Store, Google is creating an app store like no other. Once Android apps are available on Chromebooks as well as on regular Android devices, are they even “Android apps” anymore? Developing an app for Android will soon mean developing an app for an absurdly huge and diverse range of devices and a whole new world of potential users along with it. You’re creating something not only for smartphones and tablets but also for laptops and desktops — all in one single swoop. And with the responsive-design optimizations already required for Android N’s multiwindow function, developers shouldn’t have much extra work to make sure their apps work well on Chrome OS. That means the appeal of creating an app for the Google Play Store is going to be greater than ever — which should in turn mean more and more developers will be motivated to make Android-slash-Chrome a priority. It’s a win for them and a win for us. With this move, Google has essentially created the app store to rule all app stores — simply by making the most of its existing platforms and brands. 4. This move could open the door to some very interesting possibilities in the future. Chrome OS is an operating system based on Chrome, the cross-platform browser, and the two programs share an awful lot of DNA. So what if one day, Google were able to leverage the same system it’s created to allow Android apps to run on Chrome OS and use it to allow those same apps to run within the regular Chrome browser on other operating systems? It’s a purely hypothetical and slightly insane notion, but maybe it’s just insane enough to be achievable. After all, Google’s ultimate goal as a company is to get you to spend more time using the Internet and thus Google services, regardless of what kind of device you carry. That’s how Google makes its money, and that’s why Google has always had a largely platform-agnostic approach to development. Remember our question from the start of this conversation — about what constitutes an “Android device”? Yeah…take a minute and try to wrap your head around that now. Chromebooks are about to become multiform gadgets that run Android apps alongside Web apps. They’ll function as Android laptops, tablets, and convertibles — only they won’t technically be using Android; they’ll be using Chrome OS. But they’ll be fully integrated with the Android ecosystem, all the way down to app-to-app sharing and native notifications. Android apps and Web apps, meanwhile, will be nearly indistinguishable on those systems. And it’s up for debate whether the Android apps will even be“Android apps” at all anymore, or if they’ll be something else altogether (Google Play apps, maybe?). So with all these new possibilities, what really is an “Android device”? Is it a device that runs the Android operating system? Or is it any device that functions as an Android agent and is integrated into the Android ecosystem? When the boundaries we know are being detonated and redrawn, where do we draw the line? If you really want to blow your mind, consider one final thought — If all Android apps can eventually run on Chrome OS — and if Chrome OS evolves to look more like Android while Web apps and Android apps grow increasingly similar in design — would you notice the difference between a phone running Android and a phone running Chrome? The lines are about to blur in some seriously wacky ways, my friends. Google’s seemingly simple move of bringing Android apps onto Chrome OS has the potential to redefine the way we think about platforms, ecosystems, and mobile technology — and from a consumer perspective, that should be an incredible evolution. Get ready for one wonderfully wild ride.